Azure Power, a leading solar power producer in India , announced that it has surpassed 100 MWs of operating solar rooftop capacity, making the operating portfolio of Azure Roof Power one of the largest in the country. This milestone was achieved with the company's recent rooftop project commissioning of various capacities under Delhi Jal Board, Indian Railways and Solar Energy Corporation of India. With this, the company's operational rooftop capacity now has a levelized weighted average tariff of INR 5.82 per kWh, 139% higher than the lowest solar power bid in India. 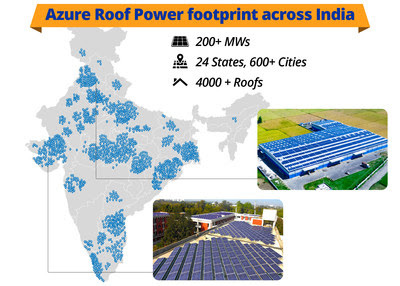 Azure Roof Power is a leading rooftop solar platform in India with over 200 MWs of high quality, operating and committed solar assets across 24 states, one of the largest rooftop portfolios in the country. The company has developed unique business models in the solar rooftop space that cover Public Private Partnership (PPP), Bilateral Power Sale and Intermediary Power Sale and is the only company in its category to do so sustainably. With a well-diversified customer base, Azure Roof Power offers its customers significantly lower cost of energy at the point of consumption and in some places at a discount of over 50% against their current cost of power. Under its PPP model, the company benefits distribution companies to meet their renewable energy purchase obligations and bridge the gap between electricity demand & supply. In addition, helping roof owners with a stream of cash flows. Through its Bilateral Power Sale and Intermediary Power Sale models, it benefits commercial, industrial and government building owners by bringing down their levelized cost of electricity and meeting their renewable energy purchase obligations, which is mandated by state governments. Azure Power through its leading and longest tenor experience across 14 states in utility scale market has created an attractive Azure Roof Power platform to de-risk race to the bottom in the large scale solar market, while still achieving reasonable scale with aggregation model with largely strong sovereign offtake credit customers. Azure Roof Power offers mutual benefit to all stakeholders offering lower cost to the customers than their current electricity bill, while achieving attractive returns for the company. Speaking on this occasion, Mr Inderpreet Wadhwa, Founder, Chairman and Chief Executive Officer, Azure Power, said, "With 100MWs operational and an overall rooftop portfolio of over 200 MWs, Azure Roof Power is among the leading and largest operating platforms of rooftop solar in India. With the only company to announce the largest financing warehousing facility and industry leading operating and rapid execution platform across 24 states, Azure is poised to deliver high value to its customers and shareholders through Azure Roof Power."